The Elijah Interfaith Institute is proud to be making a contribution to United Nations World Peace Day, September 21, 2013. Our partner, Peaceoneday (www.peaceoneday.org), through its Faith Coalition, is spearheading efforts to hold global prayers for peace on September 21st, using an appeal by Elijah’s Executive Director, Rabbi Dr Alon Goshen-Gottstein, who called on religious leaders and people of faith to join him in praying for peace (http://peaceoneday.org/faith-coalition/). 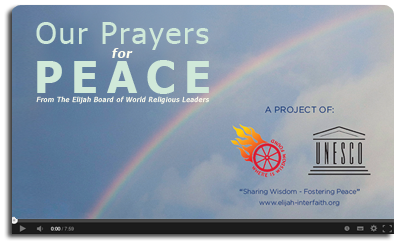 Members of the Elijah Board of World Religious Leaders have set the tone by contributing to a beautiful multi-religious compilation of prayers which will not only serve as a resource on World Peace Day but which can be used as a source of inspiration into the future. 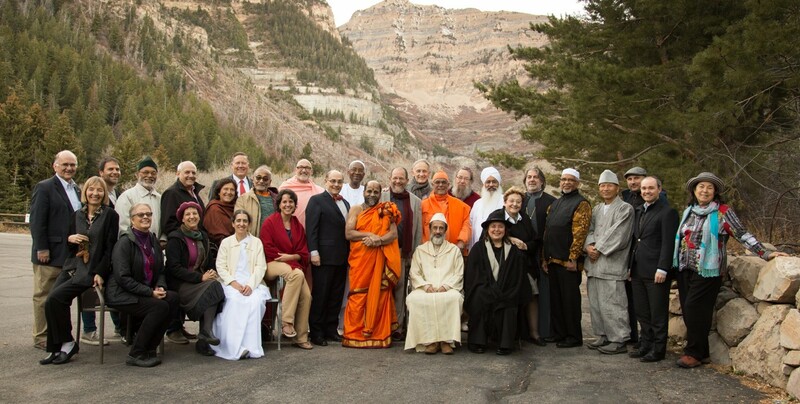 Featured in the Prayers for Peace video are Buddhists, Dharma Master Hsin Tao from Taiwan and Venerable Jinwol Lee from Korea, Swami Atmapriyananda, Hindu from India, Bhai Sahib Bhai Mohinder Singh, Sikh from the UK, Christian leaders Metropolitan Nikitas Lulias, Greek Orthodox from the USA, and Abbot Timothy Wright, Roman Catholic from the UK, Grand Mufti Mustafa Ceric, Muslim from Bosnia, Sister Jayanti, Brahma Kumaris from the UK, and Rabbis Awraham Soetendorp, from the Netherlands, and Jonathan Sacks from the UK. The Venerable Jinwol Sunim is the President of United Religions Initiative of Korea, Dean of Gwanyeong Buddhist College in Cheongju, Korea, an Executive Council Member of the World Fellowship of Budhists, and Professor of Buddhist Studies at the Seoul Graduate School of Buddhism. He reminds us that our greatest hope and deepest prayer is for world peace. ‘Buddhism offers a vision that is full of hope, a hope based in the fundamental goodness of human being. It teaches us to fully appreciate life and to live more vividly and consciously. Buddhism reminds us that all things are in reality impermanent, interdependent and empty of Self. It teaches us that we all have the potential to grow in wisdom and the ability to love and it gives us the tools to do so. It invites all of us–Buddhist and non-Buddhist– to make each day a new start and to become more wise, compassionate and humane in the way we live in this world.’ He goes on to explain that true peace will emerge when all of us, regardless of religion, set our minds on the vision of peace our particular faith holds dear and on the aspiration of peace between our different faiths. Rabbi Jonathan Sack explains that there are two words for ‘strength’ in Hebrew – ‘koach’, which is the strength needed to win wars, and ‘gevurah’ which is the strength needed to bring peace. He urges us to pursue the dream of the Prophets, for the sake of all of mankind, to find the strength to bring peace. In addition to the video, Jewish scholars and leaders associated with the Elijah Interfaith Academy have prepared a booklet of readings for use in Jewish communities. World Peace Day, most appropriately, falls during the Jewish festival of Sukkot. This festival could be described as the festival which exemplifies the principles of World Peace Day, with a focus on the unity of all humanity under the canopy of the one God, as well as the references to the Temple offerings on behalf of all the seventy nations of the earth, which historically took place at this time of year. Rabbi Yuval Cherlow has made a major contribution to the booklet, through drawing our attention to the beautiful prayer for peace of Rabbi Natan of Breslov and through his own inspirational words. He recently composed a prayer for Peace which was featured on Elijah’s Facebook page. (click for link). Other contributors include Rabbi David Rosen, Professor Yehuda Brandeis and Professor Menachem Kellner. 2. Sharing Wisdom: Finding Inspiration in Prayer. 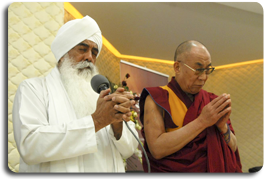 Bhai Sahib Dr Mohinder Singh, who has contributed a prayer to the video compilation for World Peace Day recently repeated his message from the fourth bi-lateral Catholic-Sikh Dialogue held at the Nishkam Centre (Birmingham, UK) in June 2013. He concluded this speech by drawing on the wisdom of a founding member of the Elijah Board of World Religious Leaders, His Holiness, the Dalai Lama. Throughout history, civilisations, societies and communities have grounded their religious beliefs and practices with sacred sites, which reflect a diverse religious and spiritual landscape of vast significance. The collective safeguarding of these sacred sites is inextricably linked with the need to actively and concretely achieve spiritual solidarity. Let us learn to take greater responsibility for the thoughts we entertain and actions we commit to. Like a wise farmer, let us devote ourselves to cultivating seeds of love (as opposed to hate) for goodness to grow all around us on this planet. Who doesn’t want peace? We all want peace: within ourselves, the world around us; peace within families and within communities; national and international peace; global peace…. All 7 billion of us have a shared responsibility to chalk out pathways to peace.